Ernie (B.A. '66, M.A. '72) and Leslie (B.A. '64, Ph.D. '79) Zomalt are passionate about global education. Both had experiences abroad-Leslie as part of the inaugural Education Abroad Program class to Bordeaux, France, in 1962, and Ernie as part of a service learning program in Pakistan as an undergraduate in 1965. These experiences changed their lives forever and would have a direct impact on their careers and who they would become. 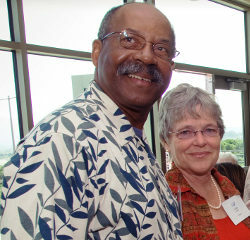 Much later, Leslie and Ernie decided to include UC Santa Barbara in their estate plans through a scholarship endowment for future EAP students. Their estate and financial planners advised them to establish the scholarship while they were still living, thereby allowing them to refine the selection process as needed and be able to see the direct benefit their scholarship was having on students. They elected to set up an annual scholarship that currently supports two EAP students each year. Their plan is to permanently endow this scholarship with a generous bequest in their living trust that will support many more students. They explored a number of estate planning options to make this gift, and ultimately decided that a bequest in their living trust provided the greatest flexibility while ensuring their wishes would be fulfilled. "Our hope is that students who wouldn't normally consider EAP (due to the additional costs) will do so and benefit from this transformational international experience," Ernie shares. Leslie adds, "College students are at a critical stage in their development. Education abroad is invariably life-changing and gives them a global perspective so critical in understanding today's world."